I woke up again not well, headache, stomachache, etc, and thought it might be nice to make peach muffins for breakfast. 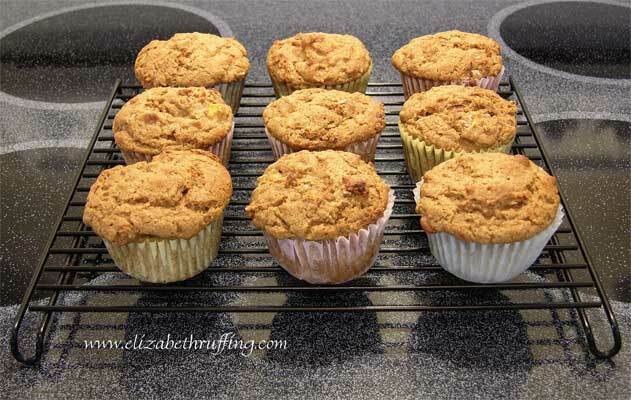 Without being truly awake, I just started to follow the Basic Buttermilk Muffin recipe in Deborah Madison’s Vegetarian Cooking for Everyone, using the Fresh Fruit Muffin variation. I remembered making these before and they were quite good, only I didn’t remember how long ago that was. I scooped out some whole wheat flour (it was supposed to be whole wheat pastry flour…but that’s what I had) from I don’t know when. It smelled, um…a little dusty. I threw it out and found a “new” bag I must have gotten to replace the first one, but even that expired a year ago. Then there was the bag of peaches that I obviously hadn’t checked on in a week. Out of three, I got almost enough fruit. I threw out two bags of shriveled frozen fruit, two jars of old baking powder, didn’t even have enough vanilla, but I still went through with my plan to make muffins. 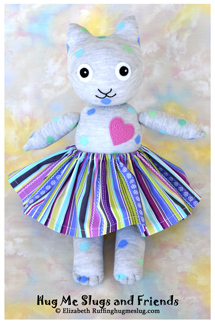 We did get some art doll photography time in yesterday and the day before. 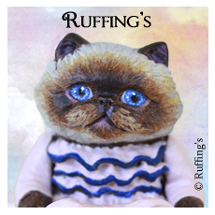 I’ve got to edit and upload Max Bailey’s new kitty doll photos to Flickr and then we’ll get them up over on the Ruffing’s blog.